1.1 To advise the Academic Policy Committee on policies and procedures relating to academic honesty. 1.2 To determine and periodically update the University's Rules on Academic Honesty. 1.3 To determine the procedures for dealing with violations of the Rules on Academic Honesty, and the penalties relating thereto. 1.4 To monitor and analyse the reported violations of academic honesty and determine appropriate enhancement measures. 1.5 To appoint sub-committees, working parties and similar bodies for the purpose of discharging the duties of the Committee, and to approve the terms of reference and membership. 1.6 To maintain a central pool of academic staff for College/School Academic Conduct Committees to co-opt into their committee meetings to consider academic misconduct cases. 1.7 To report on its business to the Academic Policy Committee (APC) at such intervals as APC deems appropriate. (i) The term of office of the members appointed by and from the Senate is two years with a staggered arrangement. 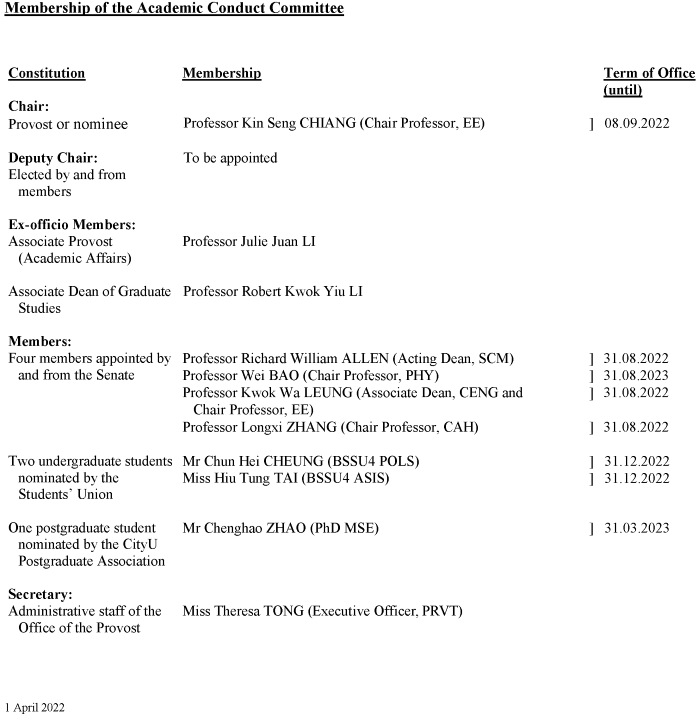 (ii) The term of office of currently enrolled Students is one year.